Ever since it was reported that a cat from Colorado was mysteriously found 1,800 miles away from her home 5 years after she went missing, the internet has been abuzz with questions over HOW THE HECK DID SHE GET THERE? Everyone from The New York Times, to Mayor Bloomberg had their own ideas about what happened to Willow, but it turns out that the most likely theory is the one that is (probably) true. Gothamist exclusively reported this morning that they were tipped of by someone who claimed to have cared for the missing cat for 3 months while her new owner was away for work. The anonymous tipster says that the owner fell in love with that cat after finding her as a stray in Colorado, and brought her back to his Brooklyn home via plane, where she was "loved and very spoiled." Unfortunately, he no longer felt he had the time to care for her, and dropped her off at Animal Care and Control last week, where the microchip scan revealed her origins, and ignited a media firestorm. Another name making cat news this week, Anderson Cooper, also plays a part in this story, as he was the first to "virtually" reunite Willow with the Squires family for an upcoming "Petstravaganza" themed episode of his show (Note to Anderson producers: I want to be in the audience for your next pet show!). In the preview clip above, Anderson tenderly holds Willow (who knew he was such a cat lover?) while chatting with the Squires family and their young daughter, who at three-years-old, is too young to have ever met her in person. Other interesting details have also emerged since the story broke earlier this week, including that the Squires' other cat passed away three months ago, and that they were vacationing in New York City just six months ago, perhaps just miles away from their long lost cat. Update: Another cute video of Willow visiting NBC News New York! Great story,glad she is back with her original owners. Love coming over and catching up on the news. Great post. I am so happy for both the cat and her real owners. What a story. Thank goodness for microchipping. Good to know that in at least one case it's Cat 1 to Coyote 0. And Anderson Cooper reporting on cats is cool too! What's also amazing is how calm Willow is in a studio audience. 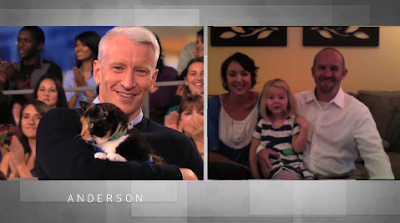 Anderson Cooper clearly has the cat man touch.